The Search for the Perfect Summer Dress - and other items!!! I recently had a sewing frenzy, then stopped for a bit - and didn't hem everything. Well I finally have these all done and here are the photos. From the left, a slit neck version (view D) of the same dress that is the second photo (view A), both from the same Simplicity pattern - 4050. The top in the third photo is Simplicty 3697 - and I may have added a bit too much to accommodate bust cup size, making the upper chest looser than I'd like. The final is a black floral cotton/lycra Hot Patterns. I've been busy, on the search for the perfect summer dress - easy to make, stylish and comfortable! How much fabric do you have, if you can give this much away??? I've spent part of the past five days going through ALL the fabric in my stash. I mean all - and I have 5 big shopping bags full, two smaller shopping bags full, and about 3/4 of a black trash bag - all full of quilting cottons, pieces of satin/silk/fancies for CQ, and other odds and ends. It feels good to get rid of some things that I finally had to admit I am unlikely ever to use. Of course, this still leaves me more than ample stash to make just about anything I could want, for coats to dresses to quilts to a cq purse and way beyond. 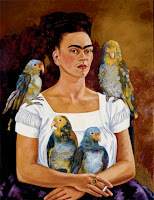 And Frida?? Well I just like this painting. This is the first project for the Pattern Review Stash Reduction Contest. 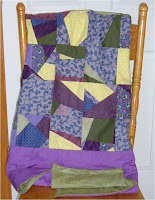 I used a combo of techniques to make the crazy squares, then added borders, a flannel wadding, and a green backing. I lightly quilted it by machine. 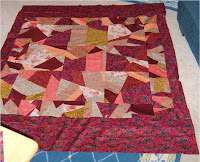 All together, I used an amazing 15.3 yards of fabricon this project. And Pat really likes it. These aren't finished as yet, but I have the tops done, awaiting quilting and binding. Actually the third photo was going to be the backing for the second, but I decided I like it so much, so it will become its own blanket. By the time I'm done, I will have used 8 yards on each of these, for a total of 16 yards, exclusive of binding. TOTAL STASH REDUCTION: 31.3 YARDS!!! And it made me go through my stash with a critical eye - I've got two large paper shopping bags full of quilting cotton to put on Craig's List soon. A few weeks ago, I signed up for Pattern Review's Stash contest. Not to win anything, as I'm sure others will exceed my output, but just to get me motivated to sew up some of my stash. I am happy to report, I started today. I have a little party for two good friends and their birthdays coming up on Saturday, so I wanted to make something. I won't say what it is, but stay tuned for photos. I have cut up and sewn almost 8 yards so far. No sewing here - since before my last post, I have been doing a big free lance job. Now I don't know why this person wanted a free lancer since almost everything I did was changed. It was perhaps the worst experience I've had in this career. And the past two days have been hellish! Now it takes a lot for me to say that. So, no sewing. But I am getting back into ASAP. So stay tuned, you will be hearing from me soon.